Devices to help parents to trace and find their children’s whereabouts are essential nowadays as child abduction and missing kids serious social issues. Being a concerned parent, you definitely do not want your child to be the next victim. Vision Localization Systems has lately launched another new locator for kids, namely Pikavu express locator, for parents who want to give their kids another layer of protection against kids kidnapping or abducting. 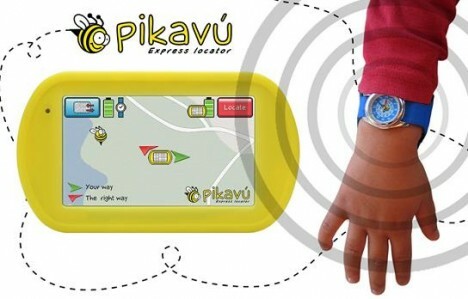 Pikavu express locator consists of a GPS wristwatch which can be worn by the kids and a portable receiver for the parent. In the event the kids go missing or is lost sight of by the parents, parents can use the receiver to communicate directly with the wristwatch worn by the kids to locate their kids without any delay. This GPS locator system offers 4 positioning systems (SBAS-GPS, indoorVision, VisionCellid and T-GSM) for parents to check for alternate positioning in the event the area has no GPS coverage. The GPS wristwatch is water resistant and impact resistant. The watch also features a safety lock which can prevent kids from removing it without parents’ knowledge. The GPS wristwatch has an alert button for kids to contact and alert their parents in the event they are in danger. They can press the alert button for 5 seconds and the parents who are holding the portable receiver will be signalled. The Pikayu GPS wristwatch offers a battery life of 3.5 days, extendable to 4.5 days if parents activate the battery-saving system. The GPS portable receiver comes with a 4.2 touch screen display. In the event kids go missing in places where there are no road maps, they can press the “locate” button on the receiver and make use of the indicator arrows to locate their kids’ location. The arrows will direct parents to their kids’ location. The Pikavu express locator costs €990 (approximately $1,440). Perhaps it might seem quite expensive compared to other GPS locator systems such as Amber Alert GPS 2G, Zoombak, and so on. However, kids are always priceless and they are not replaceable.